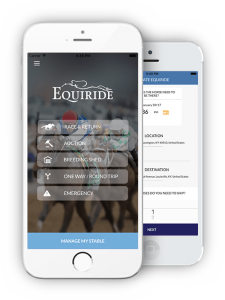 The best ideas and inventions are usually born out of the necessity to fix or improve a situation, and new horse transportation app EQUIRIDE seeks to do just that. The “lightbulb moment” for the founders of EQUIRIDE came when trainer Stephen Lyster voiced his frustrations to Chris Woodside, a college friend and fellow graduate of the University of Kentucky. Lyster hails from a family of horsepeople. He grew up working on his father R. Warren Lyster’s Tarleton Farm, and is the nephew of Wayne Lyster, who operates Ashview Farm. The now 32-year-old went out on his own in 2011 after his father retired from training, and his stable and reputation has continued to grow since then. Lyster sent out eventual GISW In Lingerie (Empire Maker) to a winning Turfway debut in his father’s colors in 2012, and enjoyed a banner year in 2016 that included a couple of victories on the tough New York circuit. Currently based in Lexington with his wife Elizabeth and young son Jeb, he also serves on the Board of Directors for the KTA/KTOB. Lyster and Woodside first got serious about pursuing EQUIRIDE about two years ago, and launched the IOS version of their app in January. An Android version was released earlier this week. The easiest way to describe EQUIRIDE is to compare it to the popular equivalents for human transport–Uber and Lyft. Once a user has downloaded the app, s/he can sign up as an owner, trainer, driver, or any combination of those distinctions. 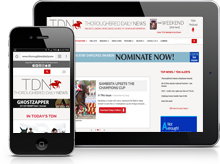 “We’re trying to bring convenience to shipping horses, help with organization and eventually, hopefully be able to offer lower costs to ship horses anywhere in the country,” Lyster explained. EQUIRIDE allows users to schedule a solo trip, or pool with others who are shipping to the same destination. EQUIRIDE mostly works with private drivers, but also uses Lyster’s brother Warren’s Warren Horse Transportation for some hauls, as well as the larger shipping companies when necessary. Like Uber or Lyft, users can rate their drivers. EQUIRIDE is designed in a way that recognizes the dynamics involved with horse ownership–partners can pay for a ride at the same percentage as their equity stake. EQUIRIDE offers a variety of shipping options, including rides for racehorses, horses going to and from auctions, or broodmares traveling to and from the breeding shed. There is also an innovative and potentially life-saving emergency option. When a user pushes the emergency button, the app will send out alerts to all the drivers in the surrounding area, and if nobody picks up, the range will get wider and wider until a driver responds. The driver will then automatically receive directions to the horse in need, and both parties will have each other’s contact information. For more information, visit equirideapp.com or look for it in the App Store or on Google Play.